William Keckler marvels: "I tried to find a picture of a lime in lime light. And I couldn't find a single photograph of this. I felt like asking Google for a divorce. All I wanted was to see a lime in a perfectly matching lime light, a lime camouflaged in lime light." Ladies and gentlemen, we present an Internet first: an actual lime in limelight. Lovin' you in the liminal zone! So it's true. You ARE the light of my life!!!!! You are a philosopher, a gentleman and a spectacle. I can only achieve the last one. Thank You, My Friend! Woohoo! Thank you -- I'm glowing! 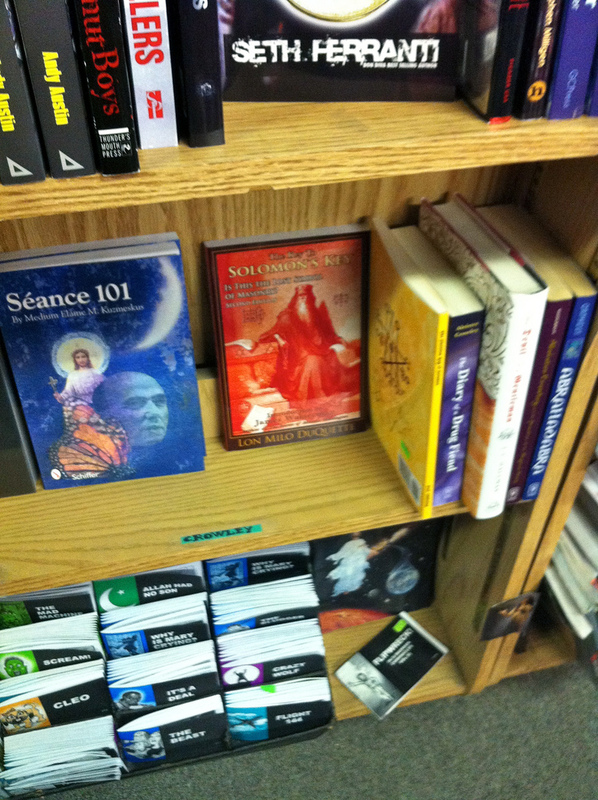 Gordon spotted our Skeleton Key of Solomon: Unlocking the Secret Reflections of Sigils and Vévés (the yellow book on the middle shelf) at Chicago's Quimby's Bookstore, sitting next to The Key to Solomon's Key: Is This the Lost Symbol of Masonry? 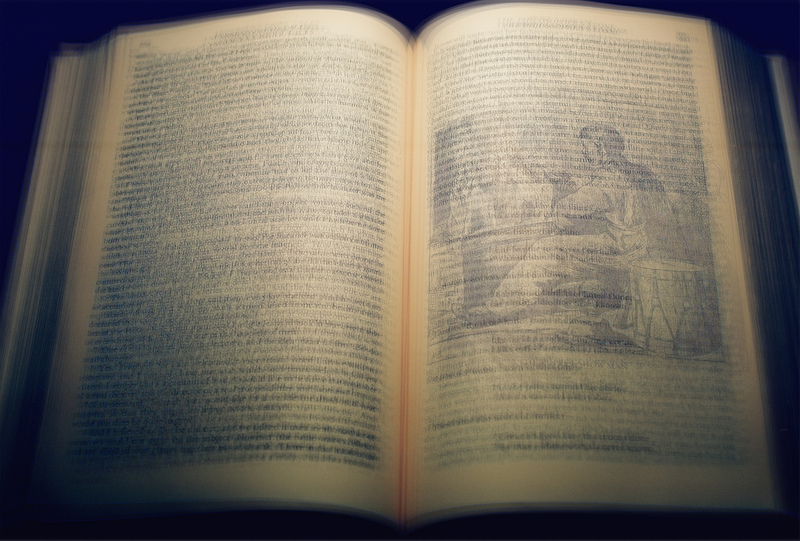 (the red book) and Aleister Crowley's Diary of a Drug Fiend (in purple). Now that's some heady reading! "As unlikely as it sounds there's strong evidence that some sections of the audience relish tedium." 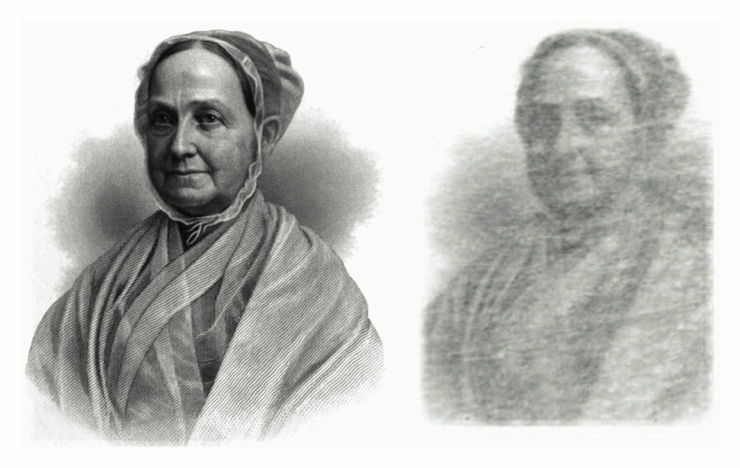 Portrait from Memoir of Rachel Hicks. Note that the Rachel Hicks appears more jovial in spectral form. To understand what's going on here, see The Ghost in the [Scanning] Machine. All kidding aside, there's a book entitled What Shall I Read Next? We can just see this title scrawled (without irony) on someone's list of to-be-read books. 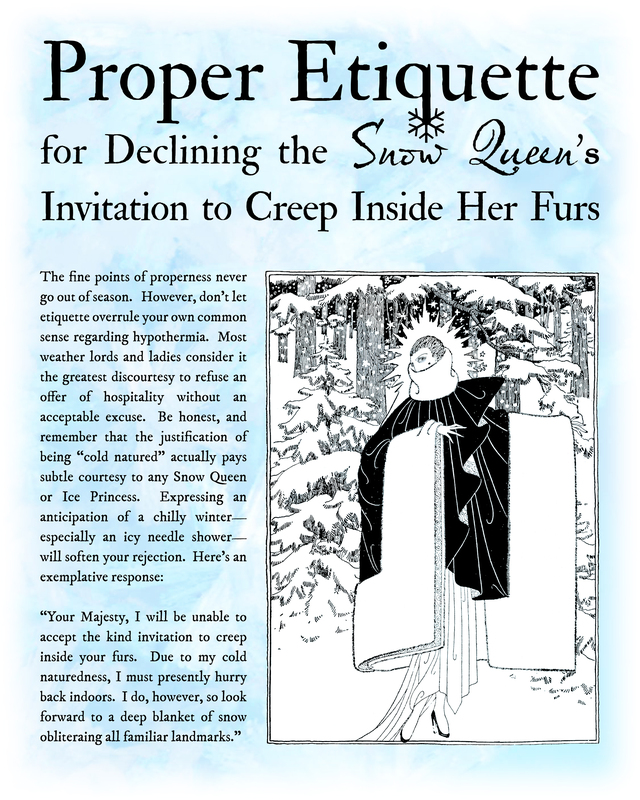 (Even more deliciously, as we type this post, the book has not yet been released but is pre-orderable.) It's like something out of a procrastinator's Calvinoesque dream. "Believe it or not, there are some [TV] producers out there who are not very nice people." Photo by bazookabill. 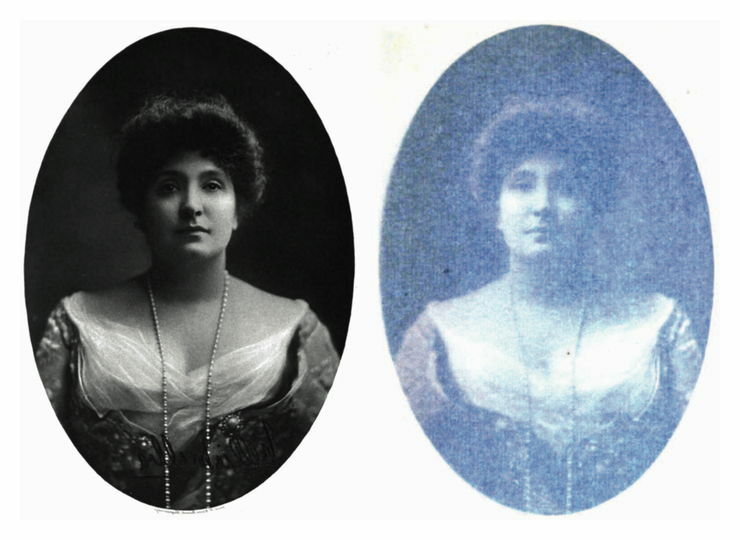 See full-size image here. One of the definitions of "pfft" in our popular dictionary of all-consonant words is "a spray from an aerosol can." So we weren't at all surprised to see the word spray painted on a wall. "The parentheticals are where the answers lie." Portrait from The Life of Sir Walter Scott. Two birds fly past. They are needed somewhere. For their correspondence in the first period of separation, Van and Ada had invented a code ... One-letter words remained undisguised. In any longer word each letter was replaced by the one succeeding it in the alphabet at such an ordinal point–second, third, fourth, and so forth–which corresponded to the number of letters in that word. Thus "love", a four-letter word, became "pszi" ("p" being the fourth letter after "l" in the alphabetic series, "s" the fourth after "o" et cetera), whilst, say, "lovely" (in which the longer stretch made it necessary, in two instances, to resume the alphabet after exhausting it) became "ruBkrE", where the letters overflowing into the new alphabetic series were capitalized. "It's happening. It's really happening. Everything is falling into place, just like you said." Why do we praise people for making a "difference" when they're actually making a "sum"? I think it's a product of the times. "Are you sitting down? Good. Now for a dose of reality. You are not super-leader." This piece was inspired by Andy Paik and Arcana Chaos. The red letter C is from the award-winning typeface created for our One-Letter Words: A Dictionary (HarperCollins) by Mucca Design. We were chatting with a Hollywood screenwriter the other day about the great dramatic pitfall of the wizard genre — problems can be solved with the wave of a hand. We're reminded of thrillers in which logician savants battle wits (it's fun when the two masterminds form a Yin/Yang connection, each respecting his rival's intellect). It's a stalemate ... until one of them fails to predict a tiny repercussion that tips the balance. Every wave of the magic wand initiates an action, but the ripple effects are for the machinations of Chaos to sort out. Consider the murderer who, with a wave of the hand, throws the incriminating evidence in the river, unable to predict where the material might wash up. (Or consider the classic Bewitched series, in which a vexing and hexing mother-in-law's action invariably triggers a chain of unforeseen consequences.) Perhaps a magician's foremost powers need to be of logic and of foresight. 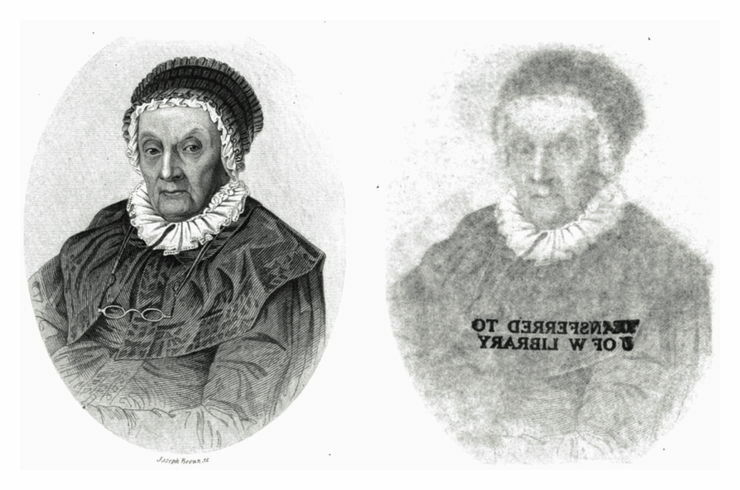 Portrait from Memoir and Correspondence of Caroline Herschel. It’s not every day we meet a spirit who has been transferred to the University of Washington library. Create a poignant rhetorical question, use it often, and make it yours. This frame is from the hilarious and endearing Mapp & Lucia series, based on E. F. Benson's novels. We agree with Nigel Hawthorne here — well-chosen words don't write themselves! 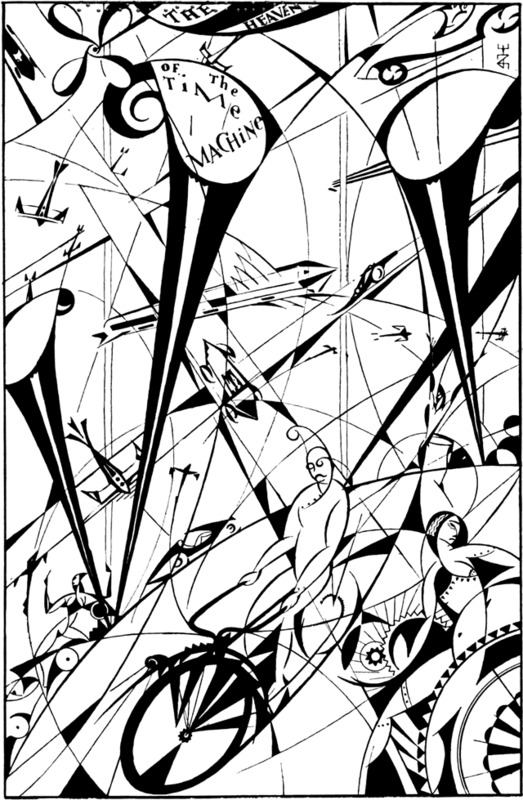 "The Heaven of the Time Machine" from Louis Untermeyer's Heavens, 1922. 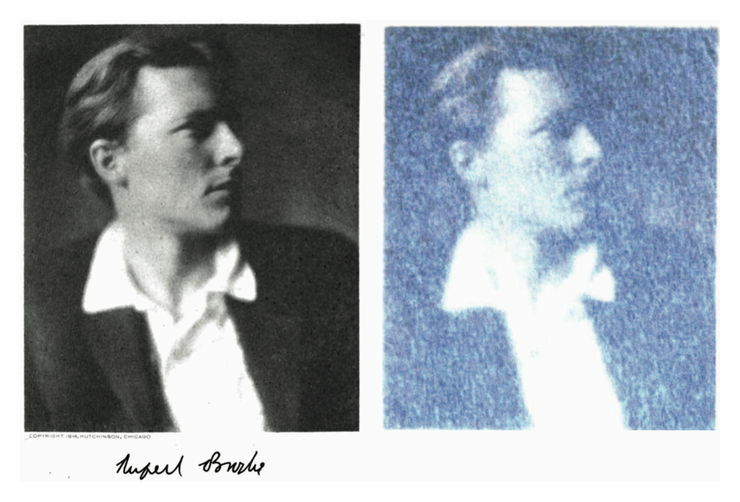 Portrait from Collected Poems of Rupert Brooke. Philosopher G.E. Moore suggested that there must be such thing as a unicorn, since the human mind can think of it and can distinguish the thought of a unicorn from the thought of a griffin. See his convincing explanation here. Only the young have such moments. I don't mean the very young. No. They very young have, properly speaking, no moments. It is the privilege of early youth to live in advance of its days in all the beautiful continuity of hope which knows no pauses and no introspection. One closes behind one the little gate of mere boyishness—and enters an enchanted garden. Its very shades glow with promise. Suddenly, a shot rings out. 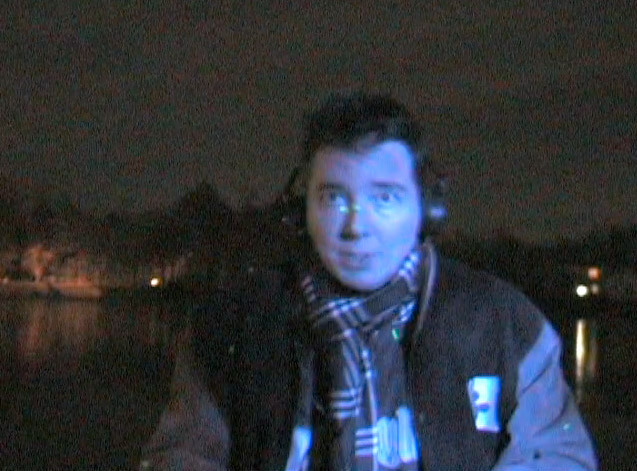 Prof. Oddfellow goes into the field (in this case, an icy lake freezing around his precarious canoe) to listen for unicorns. Join the adventure on YouTube or the superior Vimeo. The next morning, only the canoe's wake remains unfrozen (see bottom photo). Discover Oddfellow's surprising tools for luring unicorns. Hans Christian Anderson transparent book by Sam Provoas. "What most people don’t understand is that typography is the use of language that in itself is its own language – one that can take a lifetime to learn and perfect, and that few ever do." "Did they have a sale on twinkling antlers?" 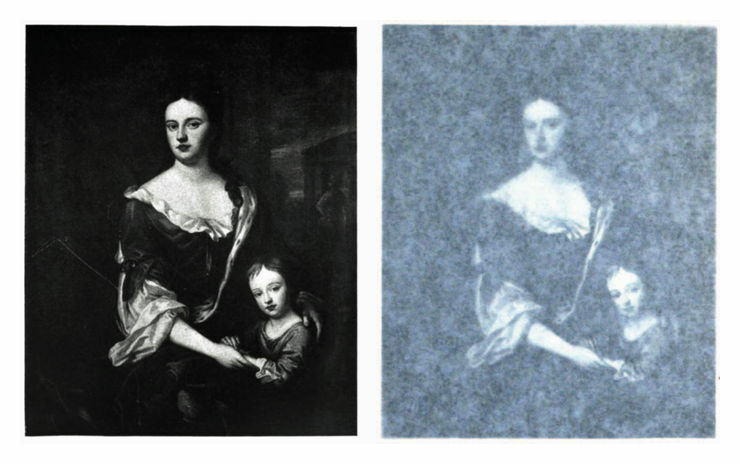 Portrait of Queen Anne and her son William from Where Ghosts Walk: The Haunts of Familiar Characters in History and Literature. *No disrespect to the Canadian dollar is intended. Q: What is the difference between a crevice and a question? A: A crevice contracts and expands and holds little bits of darkness like water, shadow and air. A question is something used to plumb the depths of a crevice. This piece was inspired by and is dedicated to Gary Barwin. Portrait from Memoir of the Late Thomas Scatcherd. This one is for our friend Jeff; we immediately noticed that the name of his mysterious pen pal "Redacted the Jackal" is an anagram of "Jacketed Cathedral." Thank you, Craig, and I believe one of my relatives was the model for those shoulder accessories. Since my ancestors fall on both sides of the Wars of the Roses, I could say I'm fiscally Yorkist but socially Lancastrian. And all the while, the resolution to the conflict was only Tudors down. "Writing is just the process of reading backwards, of unpacking from the skull what watching has filled the head with." Via beauty of the timing of this statement I am ordered to intervene. From yesterday it certainly arrives and demands to know what time is it today, while hoping it not be tomorrow. Here's a literal New Yorker cartoon caption involving a unicorn. 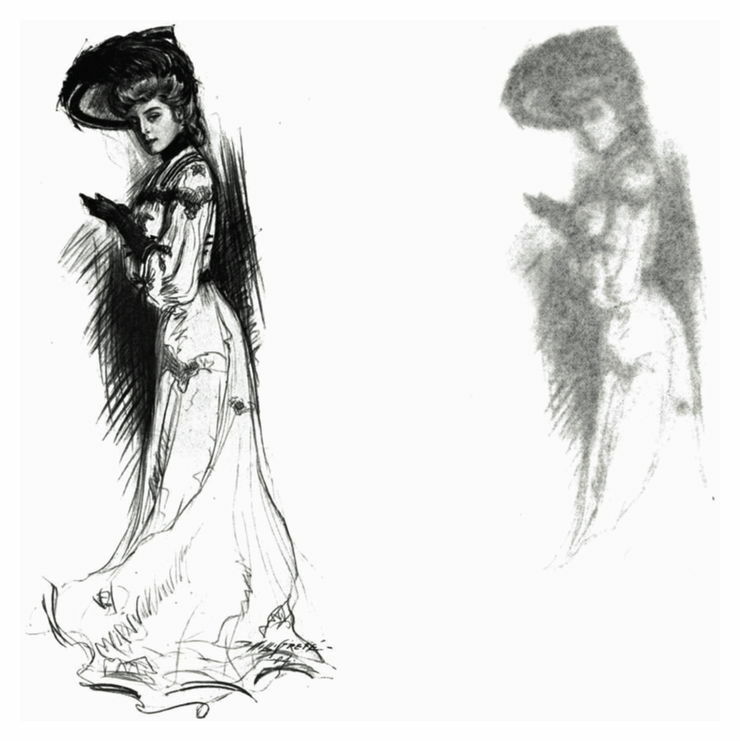 Portrait from Melba: A Biography. 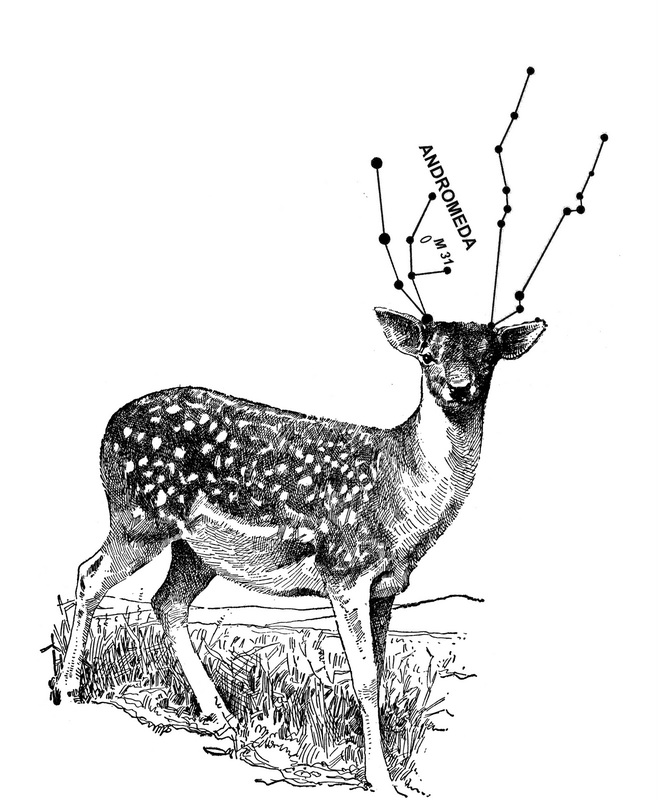 Poet Bob Grumman [in a suddenly missing blog post] uses the subject of one-letter words as an example of a "knowleplex," defined as a "reasonably coherent unified knowledge, practice, use and understanding of some subject." There are five kinds of knowleplexes; which would you guess describes our own dictionary of one-letter words? Prof. Oddfellow ventures out, armed with a viewing crystal and The Dictionary of Imaginary Places. Yes — the door knocker is from Warwick Castle; Prof. Oddfellow is related to the first fifteen Earls of Warwick. Portrait from Life of P. T. Barnum. It has been intimated that Muriel's homecoming had not been the unmixed joy she had anticipated. Suddenly, a shot had rung out. This piece is in honor of Gary Barwin's new volume of poetry, The Porcupinity of the Stars. Abracadabra (the red line) rises in popularity in the 1920s. So since you're The Man on magic words (and you are, whether you like it or not) I have a question for you. My most recent blog was about trying to find various magical applications for Google's Ngram viewer -- as you may know, this is Google's database of all the millions of books they've digitized -- you can enter a word or phrase and see its relative popularity over hundreds of years. I was putting in various magic-related words (like magicians' names and various magic tricks) when I decided to compare the relative popularity of two well-known magic words, Abracadabra and Hocus Pocus. I discovered the word Abracadabra had a huge surge in popularity in the 1920s (comparable to the word Wizard in the 1990s) -- I suspect there's a reason for the surge (probably as clear as J. K. Rowling's influence on the word Wizard), but I can't think what it would be. Any thoughts? Chris, there are actually two very different answers to your question about abracadabra's surge in the 1920s. Here's our first answer: What we see when presented with a chart comparing word density over time from the Google Books scanspace is both something and nothing at all. It's certainly something because we can perceive it, i.e. the charts dazzle us with their jagged edges and numerous nodes, suggesting the compilation of many data. However, the trends that they argue are circular, based as they are only upon the tiny subset of books which Google has scanned from the periods under consideration. If we had it on reliable word that Google had scanned, say, 95% of all extant publications, we should still consider word density measurements statistically insignificant considering that the missing 5% might contain 95% of the contemporary appearances of "abracadabra" in print. Moreover, Google cannot estimate the readership of its catalog, which would be necessary to make any evaluative claims about the familiarity of a word or phrase in common culture or parlance, which is really what the word density charts are attempting to demonstrate. Words used by authors in printed publications which survived until 2010 are not, by themselves, particularly significant. The field of statistics is famous for its bold sleights of hand. Most any contention can be illustrated by a sufficiently culled data set and evaluative methodology. Google's scanned word data are of course too fun not to keep playing with, but we must always bear in mind their inherent balderdash. Here's our second answer: The rise of "abracadabra" in 1920s is the exhalation of a meme's biorhythm. Decades later, the "wizard" meme began its exhalation, and J.K. Rowling rode the wave. We can't even say that Rowling buoyed the wave -- she is merely part and parcel of a grand expansion cycle. I'm not sure I'm 100% with you on J.K. Rowling -- certainly she rode some kind of wave but I think her talent was a wave generator of its own. I suspect if she had called Harry a "mage", then instead of showing The Wizards of Waverly Place, The Disney Channel would now be showing The Mages of Mulberry Lane. Writers are notorious copycats (though the demands of the marketplace tend to accentuate this weakness). Indeed, Chris, one definition of "meme" is an expression that can be copycatted. (The Greek root is mimema: that which can be mimicked or imitated). Without discounting Rowling's achievements, let's remember that she didn't coin the word "wizard"; it was already a charming Briticism for "excellent." Just as the common cold spreads one handshake at a time (Richard Dawkins has unsavorily called memes "viruses of the mind"), human culture spawns. Rowling, bless her heart, is simply one node of the complex informational network that enables the "wizard" meme to spread and thrive. 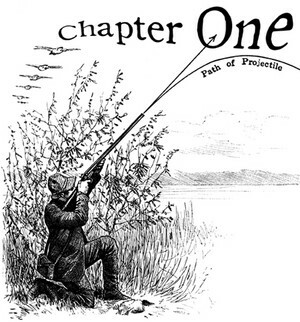 Frontispiece from The Eagle’s Shadow. Fashionistas will note that hemlines are shorter on the Other Side. To understand what's going on here, see The Ghost in the [Scanning] Machine. "It would be bitterly cold, the only certainty of the days ahead."